I have seen too many people suffer from Post Neuroma Surgery Pain. This site was built as an effort to touch more people seeking an answer to a tough problem, but can not find solutions elsewhere. Don't fall victim and have a lifetime of disability with failed neuroma surgeries or stump neuromas. You DO NOT want neuroma surgeries, it is highly unpredictable and horrendously painful results if you have not tried other treatments prior. this, what your doctor may not know. Morton's neuroma is an inflamed nerve that causes pain, tingling and numbness in the ball of the foot. Many complain of a bunched up sock under the ball of the foot, while others complain of walking on a lump, a large pebble or a lamp cord. Some describe a "twang", like a guitar string, in the ball of their foot. The pain can dull in the ball of the foot or can be radiating, electrical, tingling or burning and shoot to the 3rd and 4th toes. The pain is worsened with tight shoes, standing, walking, hills and stairs and generally relieved by rest and removal of shoes. Icing the ball of the foot twice a day for 15 minutes and/or contrasting between hot and cold for 30 minutes each day will help decrease the inflammation. Anti-inflammatory medications, such as ibuprofen or naproxen, can also decrease the inflammation and the pain. A neuroma pad will help disperse forefoot pressure, decreasing irritation on the nerve. Steroid injections and nerve sclerosing injections may also be used.When conservative therapy fails, surgery is recommended. Surgery involves releasing the ligament placing pressure on the nerve or removing the neuroma. 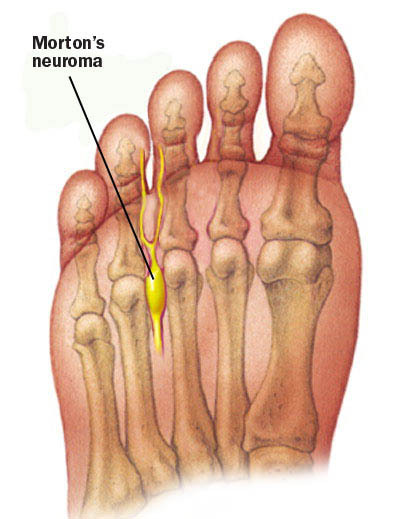 When the neuroma is removed, permanent numbness at the toes will result, but toe function is not affected. The body responds by creating new blood vessels and sending healing factors and inflammatory cells to the area to stimulate the natural healing process. ESWT has been used for the treatment of kidney stones for many years. In the year 2000, the FDA approved ESWT for the treatment of chronic plantar fasciitis, a painful condition in the heel. ESWT is not currently approved for the treatment of neuromas.In this study, researchers divided twenty five patients with a Morton's neuroma, unresponsive to at least eight months of conservative therapy, to an active treatment group or a sham treatment group. Both groups were taken into the procedure room and given intravenous sedation and a local anesthetic. The active treatment group received extracorporeal shockwave therapy and the sham group received no treatment. Do you have common symptoms of, " Pain, burning, feeling of a marble or rock in my shoe, toes spreading apart." Most common space is between either the 2nd and 3rd toes or the 3rd and 4th toes. Often times people have it in both spaces. Did you know that 75% of Americans wear shoe that is too small for them? Clinical exam and history is the best way to diagnose neuroma. To assess the efficacy of radiofrequency ablation of Morton's neuroma (MN) as a substitute to surgery, in patients not responding to conservative treatment. Radiofrequency ablation of Morton's neuroma, is an effective technique in treatment of symptomatic patient's after failure of conservative treatment and prior to surgical intervention. Great Neuroma Cure. Reliable professionals with many years of experience. We listen to our patients and work with them to address their needs through innovative solutions and using research proven, effective methods. Latest experience in technology to rid of your neuroma pain. 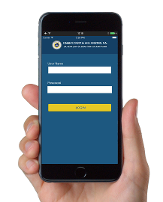 If you are a patient with disorders on the feet and lower limbs, the Virtual consultation will surely help you. We are a HIPAA Compliant facility and our Board-Certified podiatrists can treat conditions resulting from bone and joint disorders of the foot. We also offer our exclusive state of the art Radiofrequency Ablation technology for this common problem of the foot, neuromas. This is a small probe that is inserted into the neuroma(s) and a 90 degrees celcius heat is applied to the nerve causing damage to the nerve so that it will no longer conduct pain signals. This technology is used heavily in the neck and spine for nerve pain as well as for destruction of tumors. Procedure itself is totally painless. Patient is examined by our FFLC doctors, then determine if you are a candidate. The procedure is done in our operating suite at 12250 Tamiami Trail East, suite 101 Naples, FL 34113. The foot is prepped then nerves around the ankle is numbed with local anesthetics. 2 -3 application of the RadioFrequency tip is done for the treatment. Often times a second treatment is required at 1-2 months depending on patient recovery. Light band aid is applied and the patient walks out of the office. It is FDA approved as a medical / surgical device but insurance will not recognize such for payment for use in the foot. Masala S1, Cuzzolino A2, Morini M1, Raguso M1, Fiori R1. Morton's neuroma (MN) is a leading cause of disability. The purpose of this study was to investigate the effectiveness of radiofrequency (RF) in patients with chronic pain refractory to conservative therapies. Between September 2012 and December 2016, RF was performed on 52 patients. A sterile RF needle probe (22G, 5-cm needle with 10-mm electrode active tip) was inserted between the toes into the intermetatarsal space at the center of the lesion. Potential complications of the intervention and post-procedure care were examined. All patients provided written, informed consent. All percutaneous procedures were performed with the NeuroTherm® NT1100 (Neurotherm Inc., M.) device and using ultrasound guidance (Philips IU22). Continuous RF was performed with one cycle of 90 s and with the probe tip maintaining a temperature of 85 °C (impedance 95-210 mΩ). Mean VAS score before the procedures was 9.0 ± 0.6. A reduction of pain intensity was achieved after 1 week by RF (mean VAS scores 3.7 ± 0.9; p < 0.05), with a stabilization of the painful symptomatology in the following months and after 1 year of treatments (mean VAS scores 2.0 ± 0.4 after 12 months, p < 0.05). The FHSQ scores showed improved quality of life (QOL) in all patients at 6 months (p < 0.05) and 1 year (p < 0.05) of RF. No patients developed complications. RadioFrequency is a safe, efficient, and minimally invasive technique for the treatment of symptomatic Morton's Neuroma. Stump neuromas are prevalent about 50% of the time with surgical removal of the neuroma. Sometimes this could be more painful than the original neuroma itself. 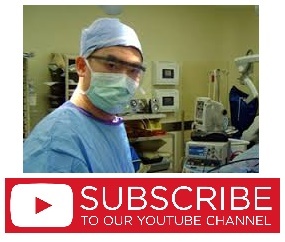 Dr. Kevin Lam and his associates are on the cutting edge of technology and surgical innovation in the field. Family Foot and Leg Center, PA doctors are chosen lecturers to other DPM's and MD's in the field of foot and ankle surgery. Genuine knowledge and care for your foot and ankle needs. "You have been an amazing doctor in helping me get relief from my neuroma that grew back. Also, the shock wave therapy in conjunction with the RF ablation has helped the neuroma to shrink to almost nothing. I currently don’t have any pain. .... I want to thank you for all of work and the success of getting me back to running short distance and I hope to be running longer distance by the fall. Thank you for all of your support over the past several months." I appreciate all the care you have done for me for so many years and I’m so glad that you have taken care of my mom as well. May your business increase and may good things come your way, as you are a gift to all your patients who really need you. Dr. Lam performed major correction of a congenital condition of both forefeet. In time, I would have been greatly reduced mobility-wise and comfort-wise…..a nearly crippling condition. I researched a second opinion through a major practice at a major Chicago hospital group just to understand my options given the seriousness of my prognosis. The left surgery reconstructed 75% of my foot, the right done in late 2013 a year after the first, is major but far less severe. 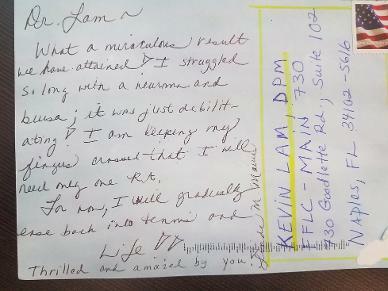 This is major work, and I wouldn’t want anyone else but Kevin Lam to do the work. If one takes the time to learn Dr. Lam’s history and has reason to work with the physical therapy staff, their excellence is easy to discern for yourself. My wife had a noninvasive regenerative procedure for a torn tendon two years ago. This is how I met Dr. Lam and gained the fullest confidence in him. Said a different way, Dr. Lam and his practice are leaders in their field and truly care about patient outcomes. Their control over difficult processes and ensuring and explaining cautious recovery in a business-like way is there for the patient. Pain and wound management are incredible because they care and because they have the skills. They have great pride in their work, which deserves patient recognition. Pride and concern are too frequently lacking in our society. Not at the Family Foot and Leg Center. 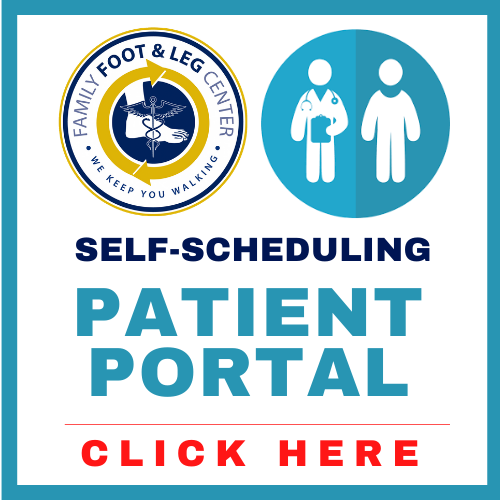 Many thanks for your excellent care, professionalism and the smile from the staff at the FAMILY FOOT & LEG CENTER. Thank you for your medical care and recommendations. Your treatment and physical therapy have made a tremendous difference in my feet and legs. The pain has diminished significantly and I feel better than I have in years. What a miraculous result we have attained! I struggled so long with neuroma and bursa; it was just debilitating! I am keeping my fingers crossed that I will need only one R.A.
For now, I will gradually ease back into tennis and life!!! Thrilled and amazed by you.